Booking an event used to take a while, with phone enquiries, waiting for brochures to arrive, and more calls. But the internet has changed all that. With instant access to details of the 10,000+ meeting venues in the UK from aggregator websites that connect through to individual venue websites, there is a wider potential audience for each venue than ever and it is now far easier for customers to make comparisons. Many venues do not realise that their website is in a ‘race’ of sorts. If your content lacks detail, or fails to engage with a visitor, crucial business can be lost and the venue may not even know. With delegate rates around £35-75 and large rooms holding between 250-2000 delegates, having empty rooms repeatedly could have a critical effect on profits. Having the best or largest venue means a lot less if the venue fails to present its space clearly online, so a competitive edge is vital. An emerging competitive trend in the hospitality sector involves the use of interactive floorplans. These allow both a prospect and the salesperson to quickly and easily comprehend the full scope of a venue. With an interactive floorplan, a venue is no longer just a list of room names and capacity numbers. It is instead brought to life in the prospect’s mind through a visually stimulating experience. Interactive content as opposed to static text or images is one of the most engaging educational tools to help people understand key details about a venue. 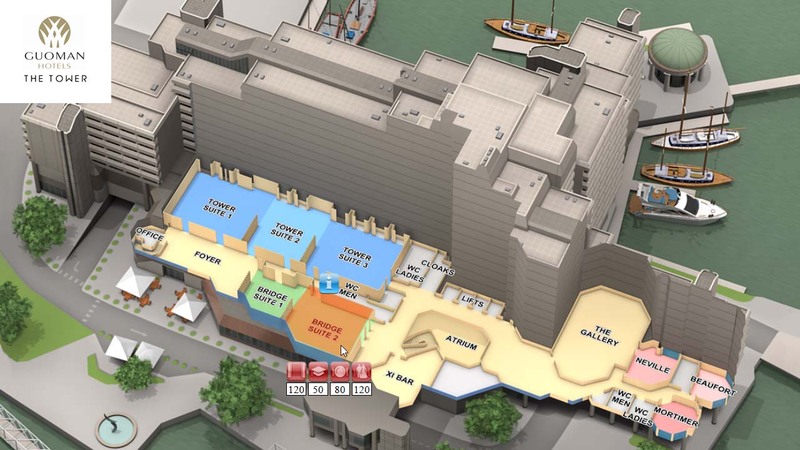 Primarily the interactive floorplan was designed to give customers a clear understanding of a venue and, after initial testing, sales staff found interactive floorplans enhanced their own ability to communicate with the customer, since they could accurately and instantly search hundreds of room and event combinations whilst conversing in order to find the best fit. Well presented, detailed and easy to comprehend information about a venue is critical to making those all-important bookings. Incredibly, some venues are only just considering the power of internet communication with their prospects and only then in a very limited form, whilst others are making great strides in terms of engaging with their prospects, developing their brand messages, encouraging requests for proposals and making conversions to customers. Forward thinking venues who have the most engaging and creative website features such as interactive floorplans will be head and shoulders above their competition. This entry was posted in Featured Blogs and tagged conference, floor plan, floorplan, hospitality, hotel, sports, vfloorplan. Bookmark the permalink.